Shapes, shapes, shapes! Are your toddlers or preschoolers learning their shapes? 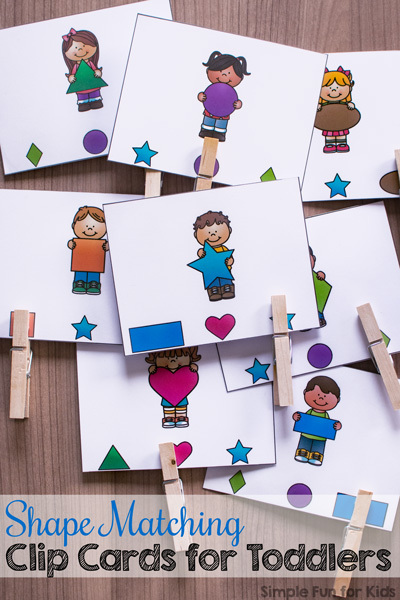 Clothespins are great fun at this age and give an excellent fine motor workout, making printable clip cards a great choice for practicing a variety of preschool learning objectives. 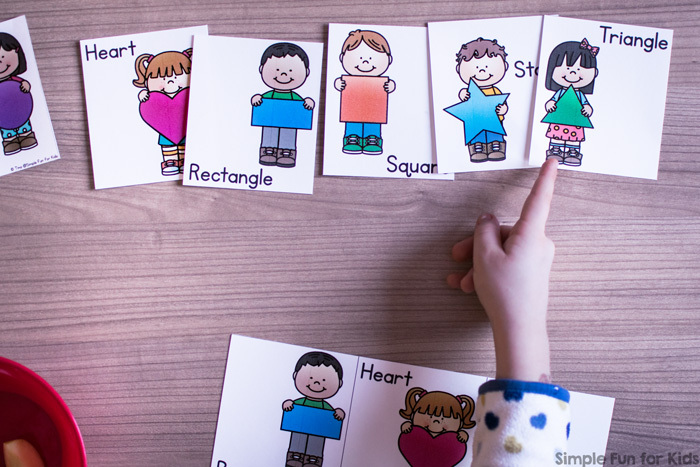 Today, I’m sharing a set of clip cards for toddlers or anyone learning their shapes: Shape Matching Clip Cards for Toddlers! I made a shapes matching game for my Match This! Matching Games for Toddlers ebook, and it really got 2-year-old N interested in shapes around him. So we’ve been working on identifying them in different ways, and this is his favorite shape activity. Laminator, laminating pouches (optional but recommended). The printable file includes two pages of four clip cards each. Each card includes an image of a boy or girl holding a shape and one matching shape and two non-matching shapes at the bottom. The colors of the shapes are the same in each instance on each page. The eight clip cards cover the following shapes: Triangle, square, star, circle, rectangle, oval, heart, and diamond. Print one or both pages either on very heavy paper or laminate them after printing on thinner paper. Cut the cards apart at the black lines. Provide clothespins to mark the matching shapes on each card. If your toddler’s fine motor skills aren’t up to using clothespins yet, you can use manipulatives to mark the matching shapes or simply use the cards as conversation starters to talk about the shapes and colors. 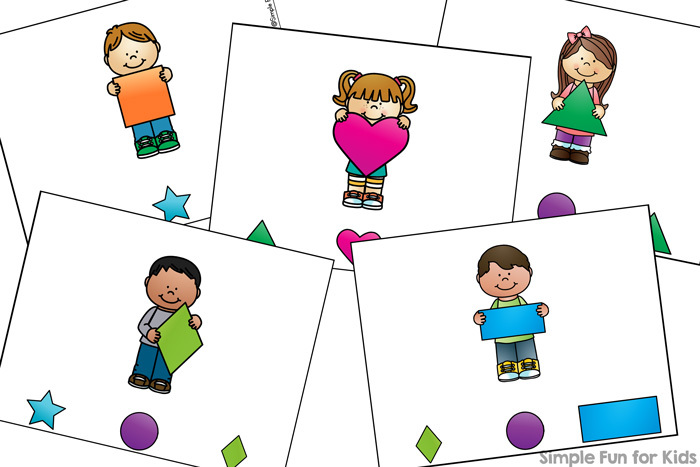 Another way to use the cards is for your kids to pick out the card with a shape you call out. Download your Shape Matching Clip Cards! I used the same set in two of the matching games in my ebook Match This! Matching Games for Toddlers. I also have some shape matching puzzles available HERE. Are you looking for more activities for kids who are learning their shapes? Here are a few others!